My New Year's Resolutions did not work out so well this year and the one thing that bothers me in particular has been my inability to lose weight. I blame this entirely on living in Germany, bad weather, etc. and never on my own laziness but hope springs eternal. L'Eroica 2011 was a great experience for me and I would like to do it again but with less effort and pain, so the key to this is shedding the weight and increasing power. Although the Peugeot was an excellent bicycle for the event, I somehow feel that riding an Italian bike would be more appropriate. I had planned to bring my Chesini (than which no bike could look more Italian!) but it would have been necessary to change the brake cable routing to be in conformity with l'Eroica's rules and could require a change of levers. I have a year to work this out. However, to motivate myself I have now purchased a vintage Chesini wool jersey. 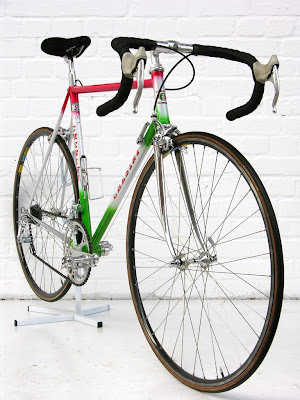 It is slightly too small at the moment so my goal is to lose enough weight to wear it comfortably for l'Eroica 2012. Let's see if I can follow through on this Simple Plan! are you going to pair your shirt with the pants from the guy below? Absolutely! All I need are red knee-high argylle socks to match. good luck with the weight! Know that you are not alone, for me it's all about the after dinner/ before bed snacks . . .